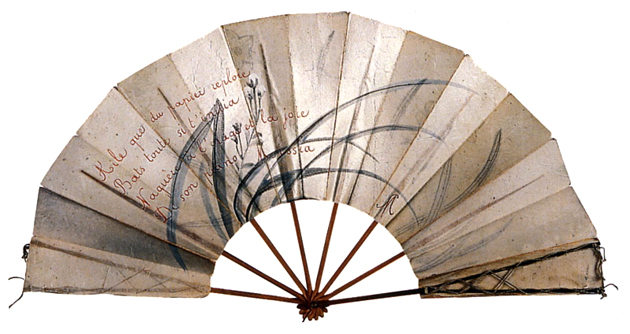 Stéphane Mallarmé, fan for Misia Natanson, 1894. Triple Canopy is pleased to announce the publication of a special issue of the magazine, Corrected_Slogans, produced in conjunction with the Museum of Contemporary Art Denver's exhibition "Postscript: Writing after Conceptual Art," curated by Nora Burnett Abrams and Andrea Andersson, on view from October 12, 2012 until February 3, 2013. The publication of this special issue, focusing on Triple Canopy's now five-year engagement with new writing and innovative use of the Web as a literary medium, also constitutes the third act of our ongoing program, Corrected Slogans: A Publication in Four Acts. In this special issue, readers will find works by Erica Baum, Caroline Bergvall, and Gareth Long, all commissioned as part of Triple Canopy's participation in “Postscript.” The special issue also contains an introduction by editors Lucy Ives and William Smith, discussing Triple Canopy's role in publication after conceptual art, as well as six relevant pieces drawn from other issues of the magazine. A preview of Triple Canopy's forthcoming print publication on conceptual poetics—in the form of a series of audience comment cards from our recent symposium, Poems for America—completes the issue.